NEW YORK Best Buy Co. (BBY) lost less money in the fourth quarter as efforts by new CEO Hubert Joly to make the company more efficient showed glimmers of paying off. The struggling electronics chain also said Friday that it did not receive a buyout bid from its co-founder Richard Schulze by the deadline Thursday, ending one question mark that had been hovering over the Minneapolis company. The retailer's fourth-quarter results beat expectations, but Best Buy gave a cautious outlook on the first quarter because it is ramping up investments and the timing of some sales has changed from last year. Best Buy has been working to turn around results as it faces tough competition from online retailers and discounters. The company has cut jobs, invested in training employees and started matching online prices. Results show that the changes are beginning to help. U.S. revenue in stores open at least 14 months rose 0.9 percent, the best performance in 11 quarters, Joly pointed out in an interview with the AP. "We have momentum building. We're at the beginning of a transformation taking hold," Joly said. Results may give investors more faith in new management, including Joly, who joined the company in August, and CFO Sharon McCollam, who joined in December, said NBG Productions analyst Brian Sozzi. He said Best Buy is showing "striking positives," including better-than-expected gross margin -- the percentage of each dollar in revenue a company actually keeps -- and an 11.2 percent increase in U.S. online sales. "Every transaction online was essentially the equivalent of convincing groups of previously disenchanted customers that yes, Best Buy is finally price competitive," Sozzi said. Earlier this week Minneapolis-based Best Buy announced 400 job cuts at its headquarters as part of a $725 million cost-cutting plan. On Friday the company said it expects to announce more job cuts later this year. The company also said it plans $700 million to $800 million in capital spending and $150 million to $200 million in other expenses in fiscal 2014 as it invests in its business, mainly online and mobile channels. 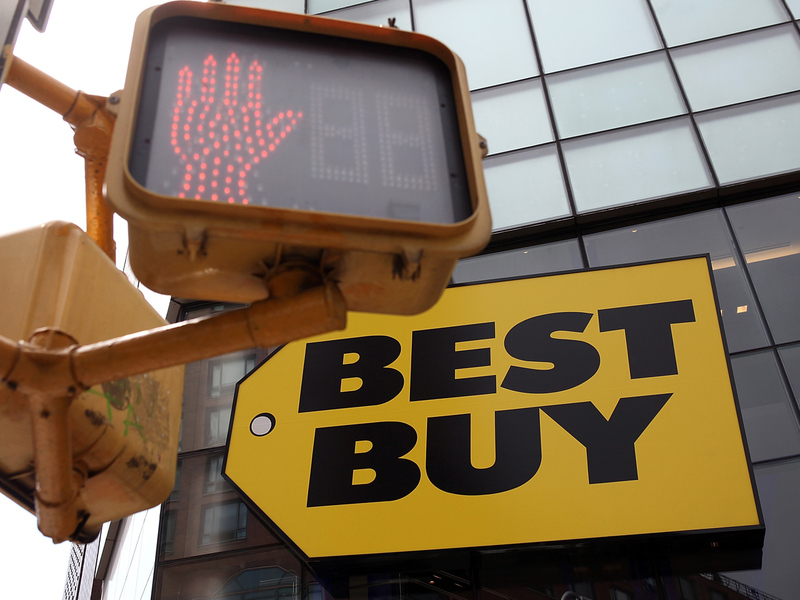 It plans to revamp Bestbuy.com by fiscal 2015. "2014 is a year of transition," Joly said in a call with investors. "Further investment will be required to advance our 'Renew Blue' transformation"
Its loss after paying preferred dividends for the three months ended Feb. 2 totaled $409 million, or $1.21 per share, for the three months ended Feb. 2. That compares with a loss of $1.82 billion, or $5.17 per share, a year earlier. Excluding restructuring and other costs, adjusted earnings came to $1.64 per share. Analysts expected $1.54 per share, according to FactSet. Revenue was nearly flat at $16.71 billion, from $16.67 billion last year. Analysts expected $16.29 billion. U.S. revenue in stores open at least 14 months rose 0.9 percent, helped by performance from Best Buy's standalone mobile stores. International revenue in stores open at least a year fell 6.6 percent due to weak results in Canada and China. Best Buy also absorbed restructuring charges of $203 million related to closing stores and severance. It took an $822 million impairment charge to write off worse than expected results in Canada and China as well as $44 million in asset impairments. "Renewed momentum in the domestic business more than offset continued softness in the International business," Joly said. For the year, the loss totaled $249 million, or 73 cents per share. That compares with a loss of $1.32 billion, or $3.57 per share, the year before. Revenue edged down less than 1 percent to $49.62 billion from $50.04 billion. CFO Sharon McCollam said she expects first-quarter results to be "under significant pressure" because there will be a week less of sales compared with last year. Also, people buying TVs before the Super Bowl helped the company in the fourth quarter this year, compared with the first quarter last year. That helped net income by 14 cents per share in the fourth quarter. The company is also making investments during the quarter in a price-matching program and revamping its websites. Schulze, who founded the company in 1966 and is its largest shareholder by far with a 20 percent stake, had been considering a bid or selling his stake since resigning in June, following an investigation that led to the resignation of CEO Brian Dunn due to an inappropriate relationship with a female staffer. Schulze had until Feb. 28 to make an offer for the company, but no offer materialized, Best Buy said Friday. Shares rose 28 cents to $16.69 in morning trading. The stock has traded between $11.20 and $27.95 over the past 52 weeks.